My memory is pretty bad, but there are a few things etched in my mind: when I first laid eyes on my wife. The moment the doors opened at the back of the church and she turned the corner to walk down the aisle. The birth of my daughter. But, I also won’t forget this random day in February when I was 12 years old. I spent many Saturdays going into my dad’s office while he caught up on work. My sister and I would play on the phones — calling each other from room to room, pretending we were on important calls. I would sit at the desks and write on my dad’s letterhead. I would gaze with big eyes at the walls of filing cabinets. To me, this lending office outside of Portland, Oregon was a kingdom and my dad, as manager, was the king. Every night I would hear the garage door open and I’d run down the stairs, slide around the corner in my socks, and greet him at the door. “How was your day at work?” He’d talk about his meetings, deals he had closed and new people he hired. Then, the next day, he would go back to work. The end of the day would come, the garage door would open, and I’d come running down to meet him again. This repeated day after day, year after year, until Valentine’s Day when I was 12 years old. He went to work. The end of the day came. The garage door opened and I came sliding in to meet him. But something was different this day. I could see it on his face. He was holding a box with all his things in it. When I say those words, you know exactly what happened. But, to a 12-year-old kid, I didn’t understand. How could they fire him? Didn’t they know about the awards he had won year after year — “best in the company.” Didn’t they know how much money he had brought in for the company? Didn’t they know that his branch was consistently top in the state? Didn’t they know how hard he worked? Didn’t they know how he pushed himself, set higher bars, and managed his team to do the same? It wasn’t that he got fired. Sometimes people don’t work out and are better off working elsewhere. That wasn’t the issue here. This was about someone not being treated correctly. That moment is etched in my mind because it didn’t make sense. Unfortunately, I would come to find out that it was called “business.” Over the next 16 years, I would learn that the expression, “it’s just business,” let you treat people poorly and get away with it. “It’s just business” was a get-out-of-jail-free card that meant you didn’t have to think about an employee’s family, health, or happiness. The workplace taught me that people are expendable and that profit is the most important thing. People are cogs in machines — get as much out of them as you can. I learned that weekends were when you could do things you were passionate about, but the workplace was where you did things someone else was passionate about. It all seemed so wrong. What happened to that wonder I used to have for “work?” Was work and business really this bad? It wasn’t about the “perks” like free food at work or a loose vacation policy. Those are things that only large companies with funding can afford. No. These companies were set apart by the way they cared about people. People are humans, not cogs in machines. There are finally companies that champion these values. They care more about the health, growth, and happiness of their people than they do about just making a profit. The number one thing I hear from my thousands of Sumry users is that it’s really, really hard to find a job at a company that will care about you. That is sad. It shouldn’t be that way. It should be hard to find a job at a company that treats you like a machine, not the other way around. I’m tired of people telling me this is impossible. It takes not setting for the status quo. That means founders and CEOs deciding that their people is all they have — that treating them well is the best thing they can do for their company’s growth. It takes individuals refusing to apply at companies that treat people like machines. It’s not hopeless. You can find a company that cares about you as a person. My team is building tools that make it easier to find these companies. I want “it’s just business” to be an expression we use to talk about the ways a company made it possibly for a father to attend his son’s tee-ball practices. I want that expression to be used to talk about companies that insist on emotional and physical rest for their employees. 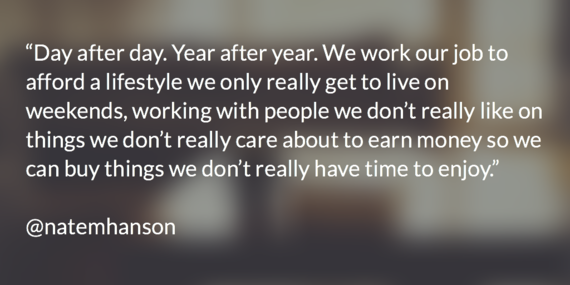 “It’s just business” doesn’t have to be an excuse to treat people poorly. It should be a war cry for a new way to work: where people are treated like humans. Where families are valued and having a healthy life is the goal. Where growing and getting better professionally and personally is encouraged. It’s business that we can be excited about. It’s work with a purpose. You see, that day my dad walked through the door is forever etched in my memory. I’ll never forget it. I never want my daughter to see me walk through the door with a box full of my dashed hopes and dreams. I never want to put my trust in a company that doesn’t care about me. That day in February when I was 12 changed my life. My dad would go on to start his own business and prove that he truly was the king I always thought he was. He pays his employees more than most in his industry. When one of his employees needed a car, he gave them one of his own. That day completely changed my perspective on work. I’ve joined my dad in a revolt against the status quo. Do you hear that? It’s the sound of the garage door opening. What side of “it’s just business” will you be on? This article was first published by The Huffington Post on October 23, 2015. It’s time we surrendered to the truth: We’re not really happy at work. We live in a world of hover-boards and Siri, of possibility and opportunity. It’s evident that we have advanced 200 years beyond the industrial revolution. Yet while we live in these advanced societies of freedom and democracy, we choose to work in corporations of structure, rigidity, hierarchy and greed. From 9 to 5, Monday through Friday, we might as well be living in the 1820s. We are all too familiar with the sinking feeling of Sunday evening. After indulging in a life-giving weekend full of things we love, we are now hours away from reentering the corporate race. Remember when we entered the workforce young, innocent and full of hope? Remember how we put our trust in corporations — assuming they had our best interest in mind — only to find them full of politics, power and ego? It used to seem so strange and wrong. But everyone else seemed fine with it, so we went along with the norms we strongly sensed: Leave your personality at home. Bring your macho, alter-ego to work. Be professional. Fight for power and the next promotion. Ditch your personal dreams and aspirations. Put your family second. Day after day. Year after year. We work our job to afford a lifestyle we only really get to live on weekends, working with people we don’t really like on things we don’t really care about to earn money so we can buy things we don’t really have time to enjoy. By the time we’re in our 40s, we figure we might as well put up with it a few more years so we can retire to happiness. Many leaders are saying “no” to this vicious cycle. The movement is growing. People all across the world are rejecting this outdated, corporate vision for work and are choosing to do things differently. This isn’t about superficial, Silicon-Valley-inspired perks like ping pong tables, free food, and Playstation’s at work. It’s about real change. The kind of change that affects the core of how a company operates. Imagine companies full of happy people working to make an actual impact on problems they care about. 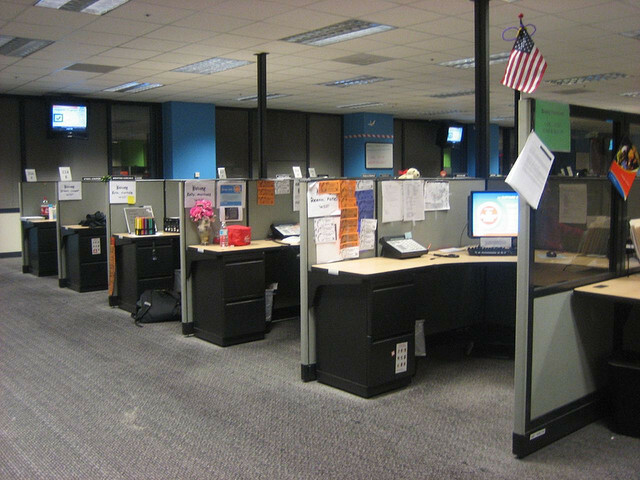 Picture working environments that enable people to outgrow their current job and reach their full potential. Dare to dream of a place where everyone has autonomy and is trusted to make the right decisions for the company and its customers. That sounds like a wonderful world to live and work in. It’s time to take a stand against ego-driven politics and hierarchies. Let’s say “no” to unnecessary corporate traditions that value power and conformity. Together, we can boldly declare our desire for companies driven by purpose, impact and meaning — where every member is encouraged to keep growing and become their best self. 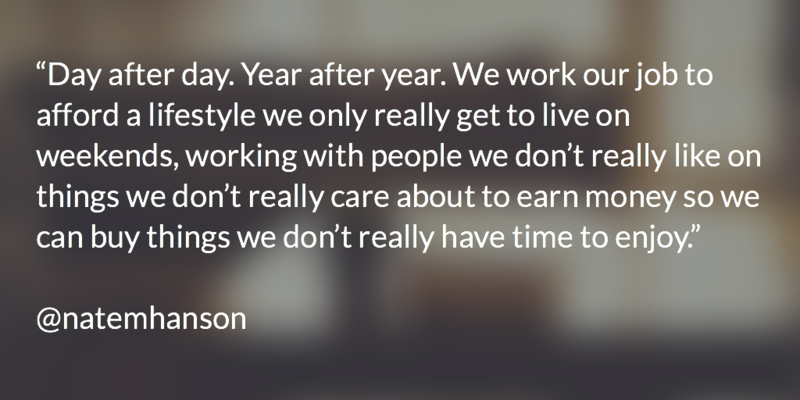 We want to work in environments where people are treated like humans, not cogs in a machine. This is an idea that binds us together. It is possible to love our jobs. Work can be a place of meaning, purpose and happiness. Let’s fight for that. A scary thought hit me while eating breakfast the other day: We’re slowly killing the future of innovation. Consider the iPad — The iPad was invented and built by grownups who had to play outside when they were kids. Fast forward to this current generation where the majority of kids sit inside staring at… an iPad. It sounds funny, but the iPad may actually cause future “iPads” from being dreamed, invented and built. From the moment we all held an iPad, we knew it was a remarkable piece of technology and art. To build it, a team of brilliant people had to solve crucial problems, invent countless components and continually choose to not give up. I remember a story one Apple executive told of his team receiving all the parts for the new iPad and then having to figure out how to fit them all into the smallest shell possible. It had to be thin, light and beautiful. How did they do it? Not only that, but how did they think to create something like an iPad in the first place? Then I remembered growing up in the small town of West Linn, Oregon. Many days were spent running around in the backyard, hooking up hoses, sprinklers and water-switches to create cool water shows. I remembered building forts with tarps and wood. I even remembered creating little ant houses with small twigs for walls, ramps and furniture. I thought back to racing out to my garden the morning after planting beans or peas to see if they had magically sprouted over night, or making whistles by blowing on thick blades of grass. I remembered grabbing some pieces of scrap wood, a hammer and nails to try to make a birdhouse. I recalled discovering a tiny maple tree leaf sticking out of the ground — and noticing it was connected to the dirt. I remembered digging it up and replanting it in a proper place in the backyard. I watered and nurtured it until I moved out, watching it grow from a single leaf into a beautiful, full grown, 30 foot tree that provided shade for our house. Then, in the winter months when it was too cold to be outside, the thousands of hours creating whole worlds, governments and economies out of Legos and Monopoly money. I didn’t like sets — I just wanted a bucket of Legos to build whatever my little head could dream up. If you’re over the age of 20 or 30, I’m sure you have similar stories of adventures in the woods — of having to solve problems and think outside the box. You probably recall creating your own fun with seemingly boring items. You weren’t dependent on someone else’s creativity and ingenuity. You knew how to dream. You didn’t need someone to entertain you or design things for you to have fun with. You could create a game with pinecones and sticks. When this past generation of Apple creators sat down to dream up the next product, I believe they subconsciously drew back on their own “backyard” roots. They knew how to solve problems because they had solved them before. They knew how to dream up new possibilities because they had been doing that since they were a kid. This brings me to the startling truth: If we allow the current generation to be satisfied thinking within a 9.7‑inch box, we’ll rob them of the curiosity and creativity that it took to build that very device they’re holding. If we don’t remove easy entertainment from our children, they’ll never learn to create their own. Even Steve Jobs, the visionary behind the iPad, didn’t let his kids use the iPad. He pushed them to play outside, read books and be fascinated with good conversation. It’s time to look inward. Are we losing the sense of wonder that we used to posses? Are our children simply following in our footsteps? Are we grownups forgetting the adventures we had? Are we lazily reading Twitter instead of showing our kids the endless possibilities of curiosity and dreams? We have the potential to create a new generation of kids who can imagine and explore — who can think outside the box and create exciting things. If we don’t, those little maple leafs will go unplanted and eventually die. The ants won’t have a fort to play in. The beans and peas won’t have a friend to look after them everyday — and, more importantly, the future “iPads” (or whatever is next) won’t be created. Let’s raise a generation of kids that build bird houses and sprinkler shows. A generation that plants bean seeds, maple leafs or whatever else their minds can dream up.